By the time the Alice decision marked its second anniversary, more than 8400 applications got abandoned while 60,000+ applications got rejected due to the decision. The district court decisions clocked around 247 – invalidating 70% of them – and Federal Circuit at 40 – invalidating 95% of the patents under 35 USC 101. On June 9th of this year, the famous Alice Corp. Pty., Ltd. v. CLS Bank Int’l. will mark its 3rd anniversary. The uncertainty, however, still reigns for both patent owners and defendants to navigate the eligibility issue. Amidst the slaughtering of patents and patent applications, there have been some decisions giving a hope that this tunnel, too, has an end. In this article, we have brought 7 such cases where the claims of patents overcame the 35 U.S.C. § 101 challenge under the Alice Decision. These cases hint claims and arguments that worked in the past and survived the Alice test. This is one of the recent cases where a patent having data processing claims is declared valid. The court dismissed motion of Amazon et. al., where they argued Speedtrack’s asserted patent US5544360A invalid under USC 35 101. The court found that claim of patent US’360 are solving a problem which existing prior art don’t. The invention helps a user search only those terms that are there in file descriptions and thus negate chances of misspelling. The description of the invention and the claims created a technological solution to the problems that had existed with conventional file access methods. Because the Court finds that the patent claims are directed to a specific improvement to computer functionality, the claims are not directed to an ineligible abstract idea. The above description from the court document hints that if claims and descriptions of a patent describe how a patent solves a particular problem, its chances to survive an Alice Rejection could increase than it not doing it. This case is interesting as it clears the cacophony of CBM patents are dead and stands as proof to the fact that they can survive the Alice test. In Trading Technologies vs CQG case, the Federal Circuit affirmed the district court’s analysis on the US’132 and US’304 patents and found the claims of the patent-eligible under 35 U.S.C. § 101. The district court declared claims of the patent valid – both patents shared common specification – as it found that claims of these patents don’t just simply display information on a screen, they require a specific GUI and solve a specific problem. The district court explained that the challenged patents do not simply claim to display information on a graphical user interface. The claims require a specific, structured graphical user interface paired with a prescribed functionality directly related to the graphical user interface’s structure that is addressed to and resolves a specifically identified problem in the prior state of the art. The district court concluded that the patented subject matter meets the eligibility standards of Alice Step 1. But Alice was not the death knell of software patents. “[C]omputer software and codes remain patentable.” California Inst. of Tech. v. Hughes Commc’ns Inc. In the Broadcom Corp vs Sony Corp case, the court found the claims of patents US’387 and US’663 – A being continuation of B – directed to an abstract concept under the step-1 of the Alice test. The claims under consideration, however, passed the step-2 that finds “significantly more”. The Court finds that (1) the independent claims in the ’387 Patent are directed to abstract ideas; 2) claims 11 and 21 of the ’663 Patent are directed to abstract ideas; (3) claims 1 and 12 of the ’663 Patent are not directed to abstract ideas; and (4) an inventive concept sufficiently transforms the nature of the claims in the ’387 Patent and in the ’663 Patent into patent-eligible inventions. To draw the conclusion that claims of patent ‘387 and ‘663 are directed to an abstract concept, the court relied on the claim language. Broadcom argued that the claims in both the patents are just a series of steps and not a mathematical algorithm but to no avail. The court cited Signal IP, Inc. v. American Honda Motor Co to refute the arguments. To search for the “significantly more” in the patents, the court relied on the claims as well as on the specifications by citing the previous cases where a court included specification of a patent to determine an inventive concept. Unlike in Alice, the claims do not simply use general computers to perform abstract ideas; instead, the mathematical formula attempts to improve the functioning of compressing and decompressing video, images, and signals. Therefore, an inventive concept sufficiently transforms the nature of the claims in the ’387 Patent and in the ’663Patent into patent-eligible inventions. In Polaris Innovations Limited vs. Kingston Technology Company Inc., the court denied Kingston motion for judgment on the pleading that claims of US6850414 and US7315454 claim non-patentable subject matter. The court, however, concluded that both patents describe patentable subject matter and there is no need to proceed to the second step of Alice/Munro analysis. Kingston argued that space optimization claimed in both patents is a fundamental concept and is a non-patentable subject matter. The court replied that it believes that Kingston framed the issue too generally, as the patents recite a hardware design that leads to a slimmer memory card or has more memory chip on the card which wasn’t possible otherwise. Here, however, the benefit of the ‘414 Patent is the slimming of the physical device itself, which enables the memory cards to be used in narrower places, and the benefit of the 454 Patent is the ability to fit more memory chips on a card. This is not a case where an inventor is trying to get around the prohibition of patenting abstract processes by tying an abstract process such as multitasking (Kinglite), a computer hardware design process (Synopsys), or a bingo game (Planet Bingo, see n.2 below) to a generic computer setup that executes that abstract idea. Rather, the hardware configuration itself is the unique focus of the patent. This fact distinguishes this case from the many cases Kingston cites in which claims were found to be patent-ineligible under § 101: those cases concerned mathematical formulas, general economic principles, business practices, and other mental processes—either themselves or as performed on a generic computer—not the design of the hardware itself. Kingston has not, however, cited any case where a court found that a claim for a purportedly novel physical configuration of a piece of computer hardware was deemed patent-ineligible because it was merely the embodiment of an abstract process. In Audio MPEG vs Dell, Dell argued that the patents 5323396, 5777992 and 5539829 do not fit in any of the four statutorily eligible categories of process, machine, manufacture, or composition of matter and claim only encoding process for signals – intangible and are non-patentable. In further arguments, Dell argued that claims of patents recite an established concept of receiving and outputting information in a specified manner which is abstract. In counter, plaintiff argued that Dell is generalizing its invention that claim a recorder/decoder configured to use one particular format invented by the inventor itself rather than a general idea of receiving and outputting information in a specified manner. The court, after comparing claims of asserted patents with that of Enfish LLC v. Microsoft Corp, concluded that patents of Audio MPEG solve a problem identified and is patent eligible. Here, as in Enfish. 2016 WL 2756255, at *7, the invention’s ability to run on a general- purpose computer does not doom the claims. Indeed, the claims at issue here undoubtedly make computers more efficient. See Doc. 144 at 7. They solve a problem that the MPEG Audio standards-setting organization identified. Id. at 6. They use “a particular frame format (“396, ‘992) or intensity stereo coding (‘829) to make the audio processing of Dell computers far more efficient.” Doc. 144 at 7. The claims are “directed to specific equipment that encodes and decodes digital audio in a new way, using a specific format that is more efficient and flexible than previous methods to solve an existing problem.” Id. at 7. Unlike the claims in TLI, 2016 WL 2865693. at *2, which dealt with a way to organize images – something humans can accomplish without a computer – the claims here “encodef ] and decode[ ] a wide-band signal in a manner that takes into account the hearing capabilities of the human ear at different frequencies: by coding the most important frequencies as accurately as possible, and coding less critical frequencies less precisely, a realistic replica of the original signal can be reproduced with the minimal amount of data.” Id. at 6 (citing Compl. Ex. C (‘829 Patent) at 2:47-57; 3:39-41)). The claims thus resemble those at issue in Enfish. 2016 WL 276255. Plaintiffs are not seeking to patent a mathematical formula or the general idea of receiving and outputting information. Thus. the Asserted Patents do not claim an abstract idea. Hence, the patents claim eligible subject matter under 35 U.S.C. § 101. Because the Asserted Patents are directed to patent-eligible concepts, there is no need for the Court to address the second step of Alice. 134 S.Ct. at 2355. See, e.g.. Enfish, 2016 WL 2756255. (ii) the server computer program includes a location facility and is responsive to a request from the remote computer to communicate with the personal computer to act as an intermediary between the personal computer and the remote computer by creating one or more communication sessions there between, said one or more communication sessions being created by the location facility, in response to receipt of the request for communication with the personal computer from the remote computer, by determining a then current location of the personal computer and creating a communication channel between the remote computer and the personal computer, the location facility being operable to create such communication channel whether the personal computer is linked to the Internet directly (with a publicly addressable) dynamic IP address or indirectly via an Internet gateway/proxy (with % publicly un-addressable dynamic LAN IP address). Citrix, to prove the claim 24 is invalid, argued using an analogy where a human act as an intermediator to connect one call to another by dialing number of another. Also, it considered the aspect where all the steps of the claim could be performed by a human in a non-computerized environment. While an operator can connect callers, Citrix does not contend the operator could do so if the recipient of the call has a dynamic (changing) phone number that is unknown to the operator (publicly unaddressable IP address). In addition , the “then current location” of the personal computer in claim 24 is not simply the personal computer’s current IP address — or telephone number in Citrix’s analogy — but includes determining the then current “ communication session for communicating with the personal computer.” (CC Op. at 11483 – 84.) Finally, the purpose of claim 24, as reflected in the ‘479 patent specification, in creating the private communication channel for remote access is not simply to allow people to talk with each other, but to allow direct access of data on the personal computer from the remote computer. A telephone operator cannot and does not provide the caller with direct access to data on the caller’s desk. Citrix, to prove the patent ‘479 and claim 24 as abstract, here tried to oversimplify the subject matter of and claim 24 which didn’t work and the court caught that. But an examination of Ganger’s declaration shows Ganger did not use this analogy to describe the invention of the ‘479 patent, but that he used this analogy, along with other analogies , for the purpose of distinguishing the term “create” from the terms “use,” “enables,” and “ facilitates ” in clarifying that the location facility in the ‘479 patent creates the communication channel, and does not simply assist another component in creating the channel. The court said that claim 24 is not directed to an abstract idea as it recites a “particular approach” to solving problems that could only exist in a post-internet world. In the second step to find the inventive concept, Citrix again used Ganger Communique’s expert and Andrew Cheung, CEO Communique’s testimony to prove that there is nothing new in individual elements of the claim 24 of ‘479 patent. Citrix contended that the 24th claim represents nothing more than generic computer performing generic functions. The major mistake Citrix committed here is by not considering the claim 24 as a whole which is required under the Alice Analysis. Another mistake was of using selective citation of Ganger’s testimony. Examined as a whole, the specific features, steps, and limitations of claim-24 provide a specific solution to remote access problems that is necessarily rooted in computer technology and thus constitute an inventive concept — something more than an abstract idea merely implemented on a generic computer. In Motio, Inc. v. BSP Software LLC, the court found that the patent US8285678 disclosing a method of providing automatic version control to a business intelligence system as Abstract and moved on to the second stage of the Alice test to check for the inventive concept. The computer-implemented limitations of the patent “merely draw on the generic functionality of pre-existing computer systems” such as creating records, providing an “agent” that interfaces with a business intelligence system (what Defendants describe as “just a form of computer software”), storing the record, and storing subsequent versions of the record. It is the provision of this automated agent to solve the problem of a business intelligence system lacking native version control that amounts to significantly more than a patent on the idea of maintaining versions of electronic documents itself. 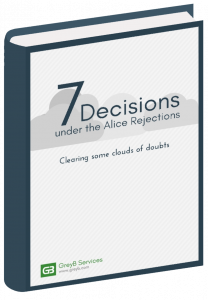 Conclusion: In all seven cases above, the patents survived after their validity was being challenged under Alice. At this moment, there is a lot of uncertainty on what works and what doesn’t. Results of all of the above 7 cases have a lesson or two for patent practitioners that can help them in building strategies for a patent challenged under the Alice Decision. Doesn’t that mean that US is surprisingly moving fast towards the European concept of inventiveness instead of patent eligible matter or abstract idea? Thanks for stopping by. I think yes, the SCOTUS decision of introducing two step test in Alice vs CLS Bank case for determining patentability of a patent, to some extent, is similar to decision by the Court of Appeal of England and Wales in Aerotel v Telco – the decision that gave four step to verify patent eligibility and also to the Article 52(2) of EPC that lists all the things which are not patentable subject matter. The common denominator approach under EPC where an analyst go beyond abstract idea/law of nature to find ‘something more’ is aligned with the second step of the Alice Test. The place where I feel the US laws differ are the way EPC considers a CBM patent as patentable when claims describes using a physical apparatus as it acquires the ‘technical character’ as gets some degree of protection. This is a great summary. I liked its consiceness and the way it has been presented. I appreciate thr efforts you put to bring this up. Interesting case studies. Thanks for this useful article! Mark, glad that you find the article useful. Do you want to read a particular kind of analysis? You can let us know. Seems quite unfair to these patent holders being subjected to the new ruling given the fact these patents were issued before the Alice decision. I don’t know much about the nitty gritty of jurisprudence but I would think these patents would get “grandfathered” in. The Examiners and Attorneys didn;t have the guidance of Alice to follow pre-2014.